We have three new prints in the shop, and a new cocktail bundle too. The three prints are from the London range by Dena Designs. I just could resist this one print and so we ordered it in it's three colourways: Pink, Blue and Green. The print is called Somerset which is very fitting as that is where Backstitch HQ is based! The bundle is named Vodka Daisy and is a fat quarter of each of the prints. Anyway, enough from me, what do you think?! 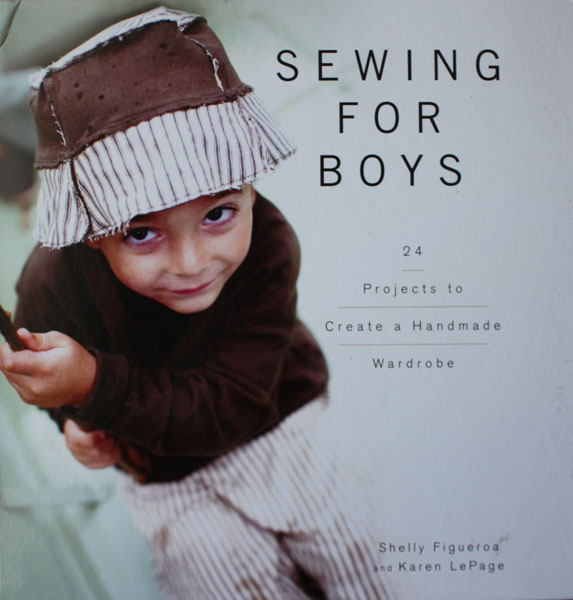 The day that my copy of Sewing for Boys was delivered was a very happy one. I have two small boys and sewing clothes for them has never been the most exciting prospect. There are some lovely patterns available for boys, but lets be honest, the girls are catered for rather better! 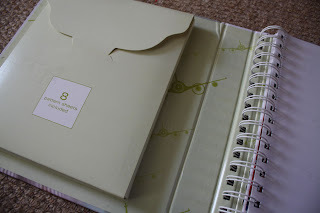 This new book by Shelly and Karen of Patterns by Figgys is totally brilliant. 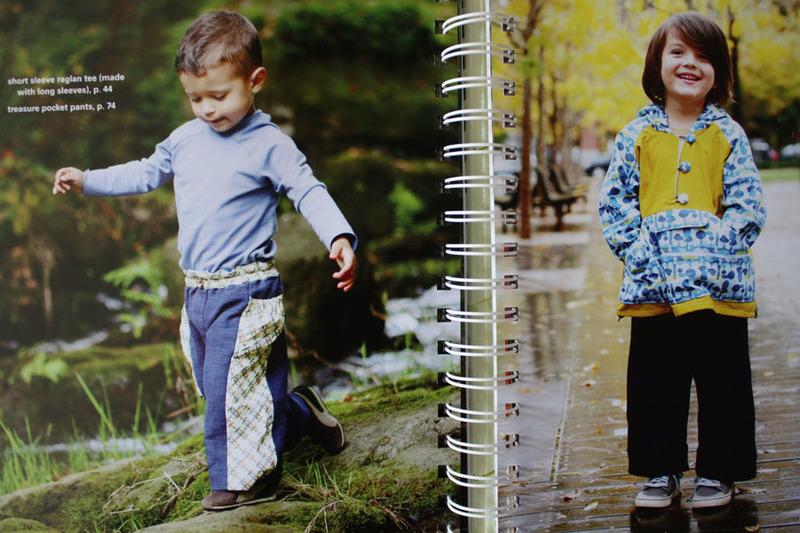 Crammed full of wearable and practical clothes for boys aged 0-7 years. There are 8 full size pattern sheets in a pocket at the front of the spiral bound book, followed by some general tips and instructions for using the book. Then comes a series of pages with large pictures showing all the projects in different make-ups... A great format - it makes it much easier to choose a project. After that you have the instructions for each pattern, and then an appendix at the end with instructions for particular techniques. This week I finally got around to making a project from the book. I went for the Treasure Pocket Pants. 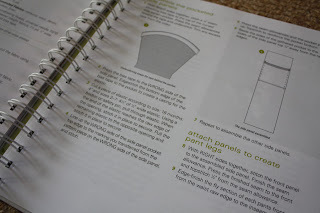 The pattern instructions are excellent, and I found Karen's Sewalong instructions really helpful too. I used some navy needlecord that I've had kicking around for ages, and some crimson Klona Cotton. 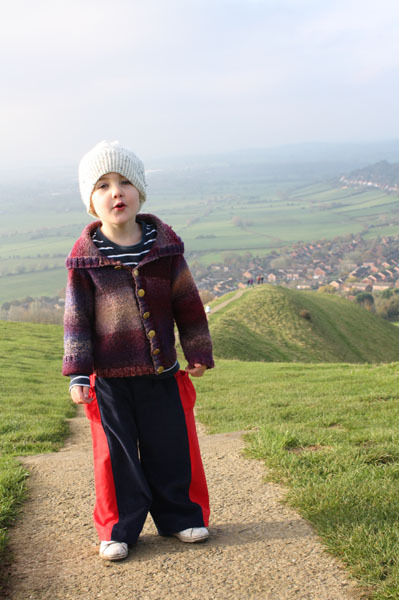 This morning my little man wore his new trousers for the first time and off we went to climb the Tor. The pockets are properly kiddy friendly, roomy and good for putting things in (I know, but most pockets on kids clothes are not good for putting things in!). They are great for running in, and look good too! I already have plans to make up another pair of these trousers for the smaller boy, and then I'm rather taken with the idea of the Two-in-one Jacket. Would you like to read the article about Sew Liberated patterns that I wrote for the September 2012 issue of Sewing World magazine? Interviewing Meg McElwee, the woman behind the pattern label Sew Liberated, has been a great joy. You can’t help but admire this woman; her refreshing approach to life and living, and the creativity that drives it is truly inspirational. Meg lives in North Carolina with her husband and two small boys. In these fast moving times of high commerciality she clearly has some very strong values based on the importance of family, the environment and a great respect for others and her surroundings. This provides the foundation that underpins her work. “My patterns feature simple, clean lines, and what I would call a ‘rustic, bohemian-chic’ sensibility. I design for women like myself, who like to wear comfortable, flattering clothes” says Meg of her designs. But, don’t take this ‘rustic bohemian’ the wrong way, Meg’s direction is a truly modern one, reflecting the more sensitive way that we are all trying to live right now, whilst definitely keeping it chic. 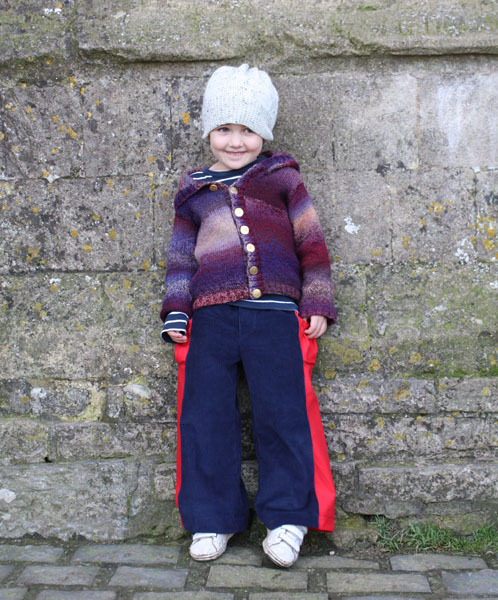 Meg also designs clothes patterns for children, and the Sew Liberated children’s designs have an easy wear, easy care quality that reminds you that children should be allowed to be children, and their clothes should enable them to play and explore the world in comfort. Meg has a background in education and before launching Sew Liberated Patterns taught three to six year-olds in a one-room schoolhouse in rural Mexico. “My own eclectic educational philosophy, is one that prominently features Montessori, but has at its core a belief in child-led, discovery based learning - learning that is liberated from the traditional, top-down method of education”. This learning approach is one that translates very obviously into her childrens sewing patterns, and particularly her latest book ‘Growing Up Sew Liberated’ which is all about sewing items for young children that are both functional and educational. “The projects are organized in chapters that mirror a child’s day – projects for waking up and getting dressed, projects for cooking and homemaking, projects for indoor and outdoor play, and projects for bedtime” says Meg. However, this philosophy of exploratory life-learning clearly has a huge influence over the way that Meg approaches all elements of her life. As well as the recent book, we’ve just seen three new Sew Liberated patterns hit our shops: the Mariposa Tee; the Aurelia Cardigan; and the Bohemian Carpet Bag. The Mariposa Tee and the Aurelia Cardigan are unique tops that use knit fabric alongside woven, which gives both pieces an ‘elegant-cosy’ look. “They're a blast to sew” speaks Meg of the tops “and are totally approachable projects even for someone who has never before sewn with knit fabrics. You'll also learn some fun, new techniques with these patterns that you can apply to your other sewing projects.” The generously sized Bohemian Carpet Bag is set to become a classic. “It’s my go-to travelling bag” admits Meg “it makes a great carry-on, or a stylish beach bag.” Brilliantly, the bag's construction is deceptively simple, thanks to a tubular frame closure. We’ve also got another couple of patterns to look forward to. Due for release in October, are two new dress/tunic patterns from Sew Liberated. Going on the massive and continuing success of the Schoolhouse Tunic (have you made one yet?) which was released in 2009, we are really excited about these. “One pattern will use woven fabric, and the other will use a knit” says Meg. Meg clearly works extraordinarily hard at making her home a haven of serenity, encouragement and stimulation for her family. She clearly has a motivation to live by her passions of “education, parenting, sewing, crafting, and family life”, and she’s making us happy too as she keeps producing Sew Liberated patterns for us to enjoy. ﻿There are some new colour grouped bundles. I can't decide if Blue Blazer or Orangeade Parade is my favourite. ﻿And then I have some Lily Keziah bundles too: the Merry Widow, and the Pussyfoot. In each of these you get a fat quarter of the most beautiful screen and block printed patterned fabric, and two corresponding Klona cottons. Have you had your eye on one of our tonal Hurricane bundles? Then get yourself over to Lily's Quilts where she is running a giveaway to win one... Christmas might just come early!